El Gaucho – Melbourne, Australia | rubybeanx. I reckon I’m pretty set. But just to acclimatise to the South American way of eating, my friend jwubbq decided that I needed to pay a visit to El Gaucho – an Argentinian asado (barbecue house) based in Carlton North, to warm up my meat eating tastebuds. We had a table of five carnivores and we got the Wednesday night special – all you can eat meat for $26. Oh my josh. 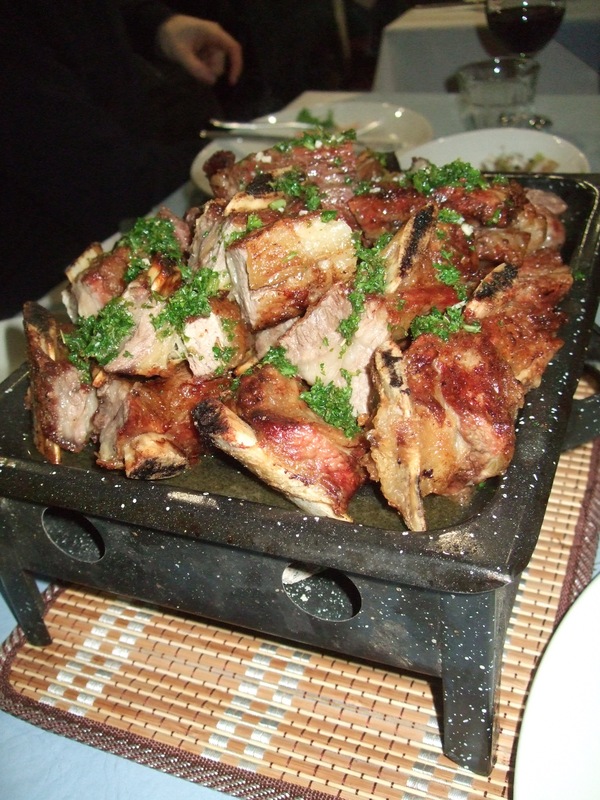 Along with a lovely bottle of Mendoza Malbec, we scoffed three large grills worth of meat. Meat meat meat. I apologise to the herbivores out there, but yum. There were delicious racks of ribs, black pudding (a nicer way of saying blood sausage), tender brisket and chorizo sausage – a lovely sample of various bits of cow, all soaking in a deliciously tangy and very salty chimichurri. Once a round of meat was finished, the lovely waitress would ask us what we wanted next and fill the grill up again. We asked for “more ribs please!” Our entire eating experience was topped off with two hours worth of Marc Anthony playing on the television screens. I totes get why JLo would go for this guy. Tags: all you can eat, Argentinian, asado, beef, Carlton North, ribs. Bookmark the permalink.